Friday February 16th 1883 It was a horribly cold windy day. I was busy about the house nearly all day. We went to the Opera house in the evening to see the play "Esmeralda" it was splendid and the audience was very good. Saturday February 17th 1883 Weather more pleasant today. I cleaned up the parlor before dinner. I was over to Hatts all the afternoon and enjoyed it very much Edith was just as sweet as could be. I did not get home till supper was ready I played on the piano most all the evening. Rob went to the valley in the afternoon. 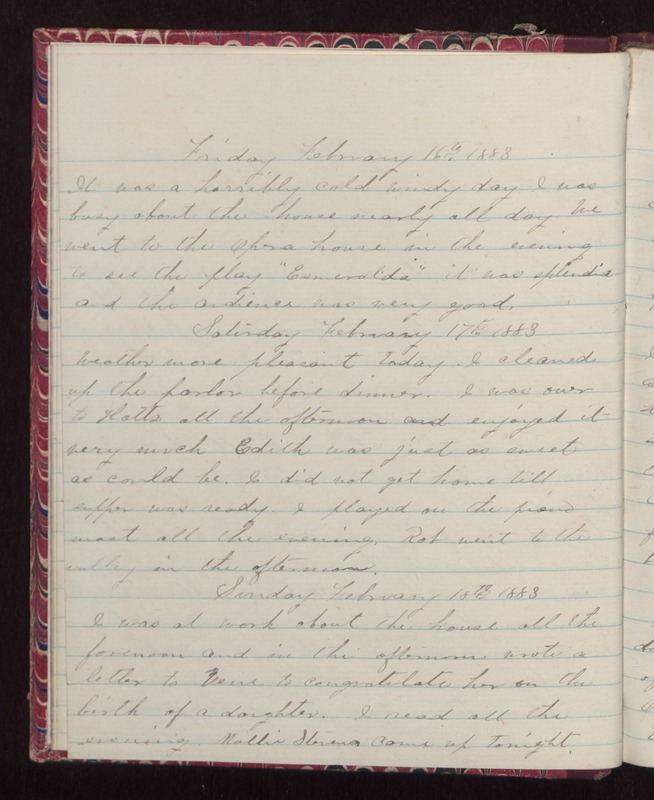 Sunday February 18th 1883 I was at work about the house all the forenoon and in the afternoon wrote a letter to Vene to congratulate her on the birth of a daughter. I read all the evening. Mollie Stevens came up tonight.